Which news organizations are having the most success with the Google News standout tag? I monitored “Featured” articles in Google News for 90 days to find out. When I previously wrote about how to use the standout tag, I wished I could have provided some insights on how often “Featured” articles appear and which publications are most often cited. So I set out to gather some informal data. For the past three months I’ve been checking Google News for articles with a “Featured” label, capturing which sites appear and confirming that they used the standout tag. I want to emphasize that this study is not comprehensive. Basically most weekdays I’d check Google News once or twice a day. I didn’t check every day or frequently throughout the day. This is meant to be a random sampling, not a complete list of every “Featured” article that appeared. As an additional note this is for Google News in the US, and I was not signed-in while doing the searches. It is also important to point out that not everyone gets the same Google News results at the same time. In that 90-day timeframe I captured 89 instances of “Featured” articles. It’s no surprise that Top Stories gets the most “Featured” articles, but I didn’t expect Entertainment to come in second. It looks like entertainment news sites are fairly active with the standout tag. One thing to note is that when a “Featured” article appears in Top Stories it often appears in another category too. When that happened I only noted the Top Stories instance to avoid repetition. Deseret News dominating the field was certainly not expected. I’d have guessed someone like CNN or The New York Times might be at the top of the table for Google News in the US, but neither of those sites appeared at all. Deseret News is using the standout tag more liberally than I would recommend, but at the moment it’s working. I’d be surprised if that continues to be the case, but as I’ve written before Google News is a strange beast. As noted above I wasn’t signed in while doing these checks, and I tried checking with different browsers and computers in case my clickthroughs were impacting which “Featured” articles were shown in my results. None of that made a difference; Deseret News continued to be the most frequent source by far. Putting them aside, National Journal did fairly well as did Decoded Science, Healthline and US Weekly. Another 10 news organizations appeared 2-3 times, and there were 20 that appeared only once. That seems like a reasonable distribution. It was also interesting that in three instances a “Featured” article did not have a standout tag (see the Google doc). Two articles were from USA Today and one was from Gulf News. Two of those stories were serious – the Naval Yard shooting and a salmonella outbreak. So Google News occasionally gives an article the “Featured” designation for reasons other than the standout tag. 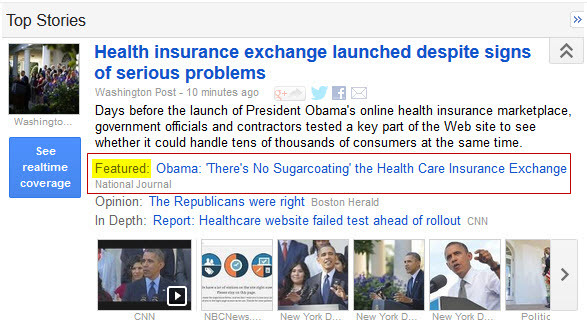 The Google News Standout Tag: Does it Work? Thanks for sharing these data, Adam. Before clicking on the link to the full spreadsheet, I said to myself “it will be interesting to see if most featured articles employ the standout tag”: the “standout tag” column answered that at the very first glance. 86 of 89 featured articles used the tag – 97%! Sure, your sampling was random, but given the number of news organizations you saw represented in featured articles, I find it hard to avoid coming to the conclusion “use the standout tag when you think it’s appropriate.” 🙂 Thanks again! Thanks Aaron, glad you liked it. I was wondering about that too and was curious to find out. Do you think adding the tag after an article is live would help with Google News visibility? Michael – possibly within the first 12-24 hours when an article may be recrawled, but after that I’d think it would be too late. Everyone loves their news, I’m actually surprised that Sports came in as low as it did. It’d be crazy to see how these trended over the course of a year, using Google’s Section breakdown… I’ll bet during peak events this can change drastically. I’ll try to take a look at this the week prior, during and after the Super Bowl and see if Sports occur more often. Thanks Trevor, glad you liked it. I’d guess your right about the Sports section during peak events. I’d be interested to learn about anything you notice around the Super Bowl. Adam, this is really useful. Thanks for committing the time to do this research. I wonder whether a full year later this is still the case – what’s your feeling on this? That’s a good question Andriy. Anecdotally, I still see articles with the “featured” label in the lead story cluster with some frequency. But I haven’t been monitoring this closely. Maybe I’ll do another study in the future. Great write-up and thanks for the research sampling. I’ve used the standout tag off and on for years. Results vary widely. A few times traffic to the tagged post exploded — relative to usual, of course. Not “exploded” as in millions of views but just many more than usual. But other times, use of he tag has had the opposite effect — buried the post completely. The best way I can explain what I’ve seen is that sometimes I use the standout tag and then the post seems to almost go into a sandbox of sorts that it never escapes. And those posts never recover. Has anyone else experienced this? Hi Harold – apologies for not responding to this sooner. I haven’t come across the opposite effect of an article seemingly being buried; the most common outcome is no apparent impact.